The year is 1993. I’ve made it to Karlovac, the front line of Croatia’s war of independence from Yugoslavia in the hope more than expectation of reaching the Dalmatian coast. My target is Dubrovnik, Lord Byron’s “Pearl of the Adriatic”, whose motto Libertas has been in mortal danger. Fast forward two decades and I’m in Dubrovnik as the author of six guidebooks on Croatia among a wave of visitors, many of whom know nothing of that brutal war, and tourism is propelling Croatia’s recovery as this Adriatic nation emerges as one of Europe’s most popular destinations. My intimacy with Croatia may have been forged in war, but I was also instantly beguiled – as most visitors are – by this epic oasis of mountain, sea and islands (1,244 in total), where the ghosts of the Romans and the Venetians drift in on the balmy Adriatic breeze. Their architecture and culture lives on too in some of Europe’s most picturesque towns and cities. I begin in Korcula Town. Local legend insists that legendary explorer Marco Polo was born here (you can visit his old house), but whether he was or not is a moot point. What is more certain is that after seeing the world he chose to return to his beloved Dalmatia. The appeal of towns like Korcula is as obvious as it was then, neatly summed up the tourist office’s favourite strapline: “The Mediterranean as it once was.” Think Italy, just less spoiled, less developed. Things have moved on, of course, since the war across this whole coast. It is not just a case of the Socialist-era hotels being refurbished, but an opportunity taken, an opportunity to develop a new kind of tourism that works with the historic rather than destroying it. A prime example of this is Korcula Town’s Lesic Palace, a member of Relais & Chateaux. Its quintet of lavish residences recline in a former bishop’s palace in the heart of the old town. Here I’m impressed by the new face of Croatian gastronomy too, with creative local chef Toni Erceg entertaining during my visit guest chefs from Villa Meneghetti further up the coast and the Hotel Bevanda’s Croatian celebrity TV chef Andrej Barbieri. From Korcula I ease across to the mainland and the Peljesac Peninsula, which was ravaged by Serb and Montenegrin forces in the 1990s. Here too tourism is leading the recovery. It’s a foodie recovery with the mighty local Dingac wines starring at slick new vineyards like Saints Hills. I head out to pluck the famed local oysters from the sparklingly clear waters to find they are also experimenting with ageing Croatian sparkling wines underwater too at Blazevo. I push on down the coast until she rears into view. I’ve arrived in Dubrovnik countless times, but I still feel a surge in my spirit on sighting this most dramatic of cities. On one flank the cleanest seas in the Mediterranean sparkle, while on the other rugged limestone crags rear. In between lies a perfectly preserved baroque city-state, a pedestrianised oasis that reclines within mighty stone walls that have never been breached in anger. Tourism has now breached them, but I think of the empty streets I found on my first visit in 1997, as a local journalist interviewing me complains about the cruise ship passengers now parading down the lifeblood Stradun. I manage to keep counsel with a quiet smile as I admire the restored buildings and businesses which have been propelled by tourist revenue. I spend a night at my favourite hotel, the Excelsior. Even when it was rough around the edges post-war I still loved the views it affords of the Unesco-listed old town. Today it boasts one of my favourite restaurants in Dubrovnik and a superb spa. I stay too at its sister hotel, the Bellevue, a brilliant transformation of an old socialist era hotel into a stylish boutique that has a private beach, plus another acclaimed restaurant and spa. On this visit I am determined to bury my personal hatchet and venture across the border into Montenegro too. Montenegrin volunteers inexplicably waded in alongside the Serbs attacking Dubrovnik during the 1990s, but an apology has been made and I witness a new determination to leave the past behind, perhaps not least in an effort to enjoy some of Dubrovnik’s tourist success. Montenegro is a country whose landscapes – which beguiled both Lord Byron and Tennyson – deserve visitors. I embark on a week with Headwater Holidays on their new hiking adventure in the Durmitor Mountains. Many of the peaks are higher than Ben Nevis and wolves and bears roam this wilderness. This is world-class hiking on well-marked trails, but our group only meets a trickle of local hikers. Then it is on to the coast and the sleepy village of Perast on the Bay of Kotor, a jaw-dropping natural amphitheatre and the nearest the Mediterranean has to a fjord. We enjoy more epic hikes and discover the town of Kotor, which echoes Dubrovnik. 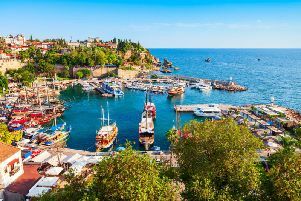 We hike up its ancient walls to appreciate its perfectly preserved old town and a bay that millionaires’ super yachts and cruise ships are now discovering. The glitzy new Porto Montenegro marina is proving a major draw and easyJet just started flying into the bay’s Tivat airport from London in June. I end my latest Balkan adventure at perhaps what is now this whole coastline’s most glamorous hotel. Last time I visited the private island of Sveti Stefan it was a mess. Today it has been reinvented as an Aman resort. I spend a few days enjoying proper luxury, revelling in the fine wine and seafood that this whole coastline has long produced, but not really been credited for until recently. I gaze back up towards Dubrovnik, glad that the all too recent dogs of war seem to be becoming just another chapter in a coastline whose story is so rich with the ghosts of the Romans, Venetians and Marco Polo. • easyJet (www.easyjet.com) fly to Dubrovnik from Edinburgh from £130 return. • Holiday Autos (www.holidayautos.co.uk) offer car rental in Croatia and Montenegro, with border crossings allowed. • Headwater Holidays (www.headwater.com) have a range of walking holidays to Montenegro and Croatia.